In an ideal world, the chicken and stock would come from a roast, but if life gets in the way, good quality, ready-made stock and bought cooked chicken will do nicely. Lay the streaky bacon out flat in a cold frying pan. Cook undisturbed over a medium heat for 2 minutes, then turn and cook for 2–3 minutes more, until crisp. Set aside on kitchen paper. Bring the stock to the boil in a large saucepan, then reduce the heat to low. Melt 25g butter in another large pan and add the shallots. Cook over a low heat for 5 minutes, until translucent. Add the rice and stir for 1 minute so it’s coated in butter. Add a ladleful of stock, stirring until there is little excess liquid left in the pan. Keep adding stock, stirring frequently, for 15 minutes. Stir in the chicken and add stock for another 3–4 minutes. Remove from the heat and fold in the remaining butter with the lemon zest and juice, 2 tsp tarragon and the parmesan; season. Cover and leave to rest for 2 minutes. 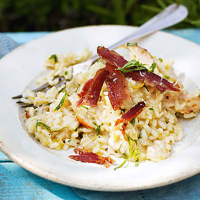 Serve with pieces of the bacon and a sprinkle of tarragon.